Vacuum infused vinylester resin / fiberglass, foam sandwich. Hydraulic steering at helm position and twin tillers direct to rudders. Double berths include the saloon, where the saloon table can drop to make a double and be curtained off. 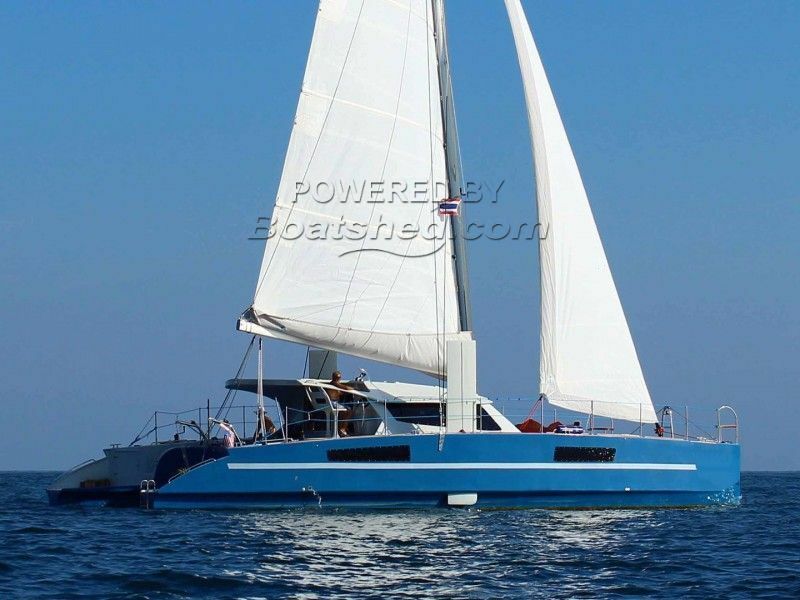 Built by the french owned and managed Catathai yard in Koh Siray Thailand with the build overseen by the owners surveyor, this fast Nicolas Gruet designed cat is only for sale due to a change of circumstances of her owner, who had her built with the intention of a circumnavigation. With a draft of only 85 cm ( dagger boards up ) she can explore the places other mono hulls and even cats cannot venture and can anchor in the best spots close to the beach, the dagger boards also provide good windward performance and with a displacement of only 7000 Kg lightship ( 10,000 Kg all up ) she is a fast boat. No need to wait 2 years to have one built, when this nearly new boat is available for immediate delivery. This Custom Catamaran Fast Cruising Catamaran has been personally photographed and viewed by Alan Giles of Boatshed Langkawi. Click here for contact details.